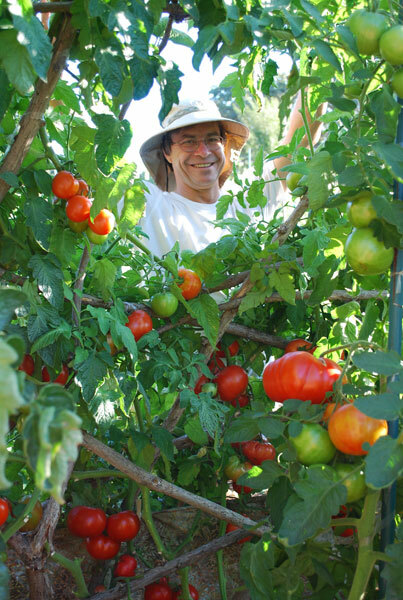 Back in the 80’s when I started growing tomatoes organically, the only way to get good tomatoes was to grow your own. Now you can get good tomatoes in season at farmers markets and high-end supermarkets, but they still don’t come close to tomatoes you can grow in your back yard, if you know how to grow tomatoes. 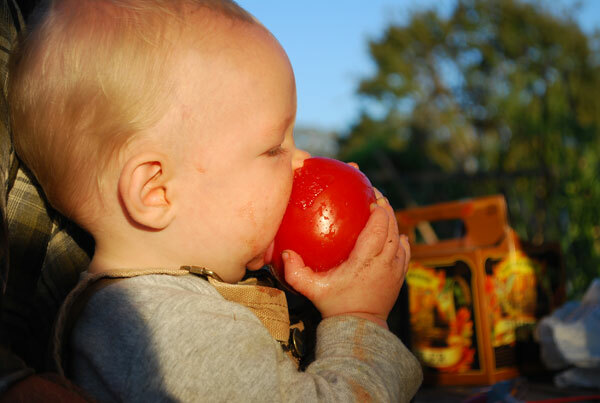 The first time you tuck into a sun-warmed, vine-ripened tomato, you’ll be hooked. Tomatoes need a long growing season, 6-12 hours of sun a day, and summer heat to set and ripen fruit. As a general rule, the larger the tomato, the more heat the plant needs. Beefsteak tomatoes need the most heat, and cherry tomatoes need the least. Tomatoes perform better when you can mimic the conditions they evolved under. Tomatoes (Solanum lycopersicum) evolved in the Orinoco basin. The fruit would wash down rivers, lodge in brush by the side of the river, sprout, then ramble over the top of the brush. Tomatoes evolved with ample sun, high temperatures and humidity, fertile soil, and plenty of water. Grow tomatoes in the sunniest, warmest part of your garden. Cherry tomatoes can get by on 5-6 hours of sun and still produce fruit, but larger tomatoes need 8-12 hours of sun a day for best performance. Tomatoes are summer vegetables that die at the first touch of frost. If you’re growing tomatoes, don’t make the mistake of setting them out before the last frost date for your area. In temperate gardens in the northern and southern hemispheres, seeds are started indoors 6-8 weeks before the last frost date for the area, and planted outside after all danger of frost has passed. Only in the warmest zone 9 gardens can you start tomatoes outside from seed and still get a crop, but even in this zone, you’ll have more and better fruit growing tomatoes from seedlings, not seeds. If you set seedlings out too early and late frost threatens, cover them with cloches or newspaper cones to protect them until danger of frost is past. Tomatoes thrive in soils with a lot of organic matter and a deep root zone. 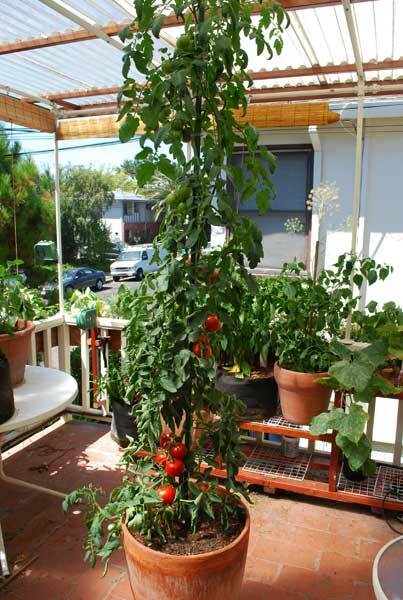 The best way to grow tomatoes—especially in small gardens—is in a deep-dug or raised garden bed, and train them vertically, as in the photo at left. If you have a lot of space and a deep, loose, loam with plenty of organic matter, they’ll do fine in widely-spaced rows. 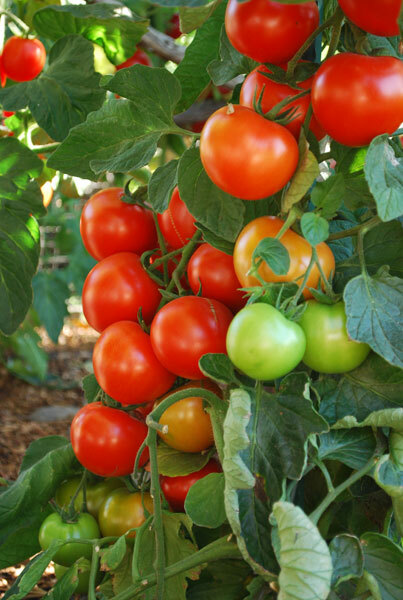 When you’re growing tomatoes organically, you can build the fertilizers into the soil when you plant. Soil microorganisms break down organic fertilizers at varying rates. 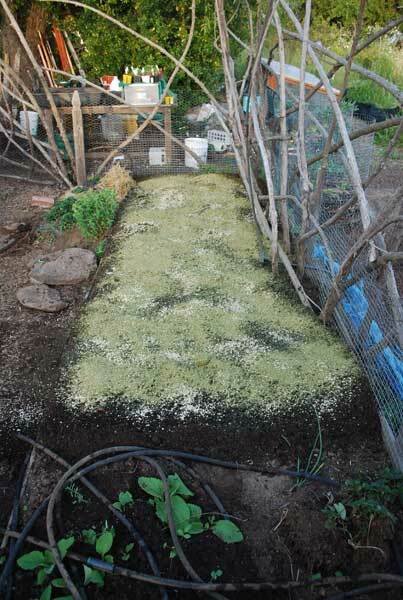 By mixing a quick-releasing organic soil amendment like alfalfa meal with a slow-releasing amendment like feather meal, you can provide for all your plants’ fertilizer needs at the beginning of the season. Tomatoes need adequate nitrogen early in the season during their most active growth, but too much nitrogen creates excessive disease-prone foliage at the expense of fruit. If you have access to good composted steer, dairy cow, sheep, or poultry manure, you can use a 2” (5cm) layer of composted cow or sheep manure, or a 1” (2.5cm) layer of composted poultry manure, in lieu of the alfalfa meal/feather meal combination. Sheep manure is particularly good for growing tomatoes because it provides phosphorous and potassium, as well as nitrogen. Fresh manure can be used, but it needs to be tilled into the soil 3-4 weeks before you plan to plant, or it can burn your vegetables. Don’t just spread it on the surface, or you’ll lose most of the nitrogen. If you use large amounts of good garden compost or the right amount of composted manure and have fertile garden soil, you might not need to add organic soil amendments for growing tomatoes. I make great compost and use it abundantly in my garden, but I still add organic soil amendments every year, because I like big, robust plants that make their own pest control and still have energy to produce bumper crops (and great photos for my web site!). If you’re starting a garden in a new place, or growing tomatoes in pots organically, you’ll get better results if you boost the soil with organic soil amendments for the first 2-3 years. Once you’re recycling kitchen scraps and yard and garden waste through a compost bin and back into the garden, you can cut back on organic soil amendments or stop using them altogether, but for the first few years of a new garden, here’s what I use and recommend. 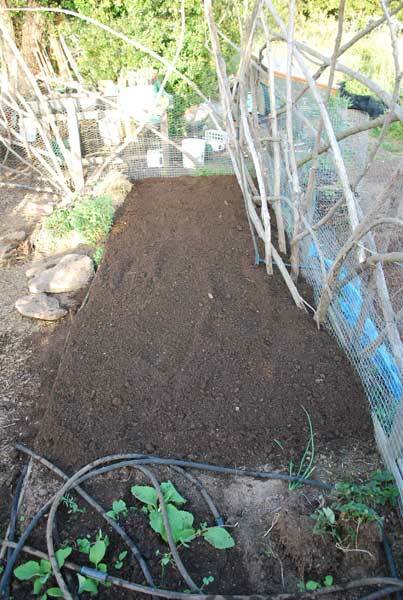 A 3-4” (7-10cm) layer of good garden compost or mushroom compost. Alfalfa Meal for early-season nitrogen (8-12lbs/100 square feet, or 2lbs per 10 feet of row), as well as some phosphorous, potassium, and sulfur. Alfalfa meal is the best all-around fertilizer I’ve found for tomatoes and other summer vegetables. Kelp Meal for potassium, trace minerals, and growth factors that boost plant immunity. Use NO MORE than 1lb/100 square feet (a light dusting on each side of the rows)—kelp meal inhibits growth at high concentrations. A hoe and some elbow grease—or a small tiller like a Mantis— to mix the compost, soil amendments, and topsoil together. Organic soil amendments must be in contact with soil microbes to be broken down by them, so mix them thoroughly into the soil. The alfalfa meal provides for early-season growth, then the feather meal kicks in about mid-season, and supplies a steady, slow release of nitrogen to fuel late-season growth in indeterminate and late-season tomatoes. Kelp meal boosts resistance to diseases, which is important when growing tomatoes, especially if you’re growing heirloom tomatoes. Of course, if you don't feel like going to the trouble and expense of buying multiple organic soil amendments, you can always use a good, balanced organic fertilizer like Dr. Earth Organic Tomato, Vegetable, and Herb Fertilizer . 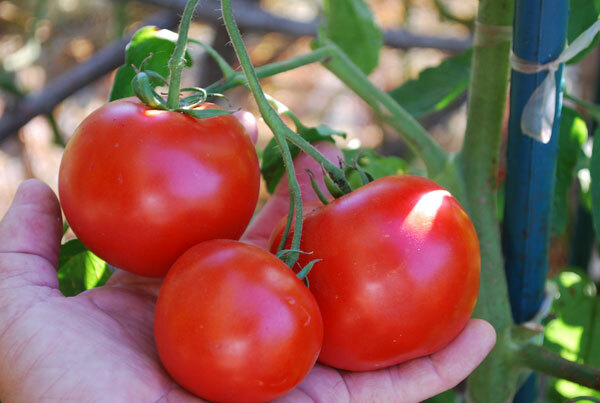 When growing tomatoes, you also have to pay attention to phosphorous and potassium levels. Tomatoes need phosphorous for root, stem, and fruit formation, and potassium for flowering and resistance to diseases. If you’ve had poor performance growing tomatoes in the past, the first thing to check is soil pH. Tomatoes grow best in a slightly acidic soil, pH 6.2-6.8. Alkaline soils have a pH of 7.0-7.8. High pH “locks up” phosphorous, potassium, iron, zinc, and many other minerals needed by plants. See Changing Soil pH for ways to lower soil pH. You can also use organic soil amendments to supplement your soil. For information on organic phosphorous sources, click Here. For information on organic potassium sources, click Here. If you’re growing tomatoes in a deep-dug or raised garden bed, shovel the top 8-10” (20-25cm) from ¼ of the bed onto a tarp next to the bed. Loosen and cultivate the layer of soil below, then lay down a 1-2” (2-5cm) layer of compost, a 1” (2.5cm) layer of composted cow or sheep manure, or a ½” (1cm) layer of composted poultry manure. Cultivate into the soil with a hoe or small tiller. 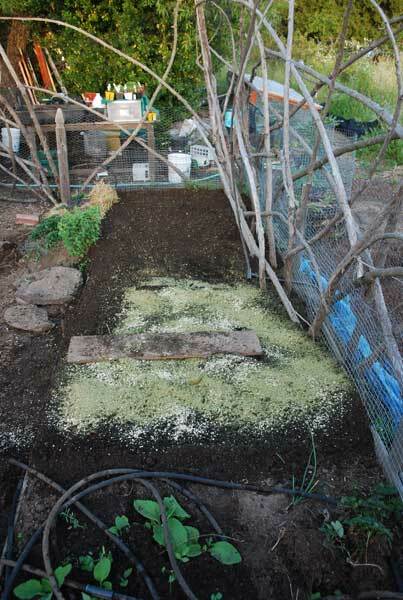 Shovel the top layer from the next section into the hole from the first, cultivate and amend the lower layer, then repeat the process with the last 2 sections of the bed. 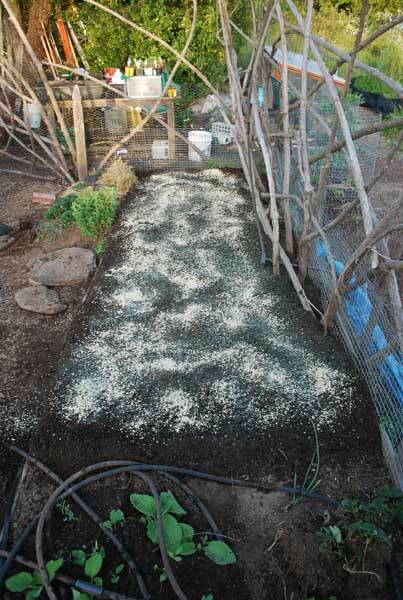 Shovel the soil from the tarp back onto the bed and rake it flat. Cultivate the top layer of soil with a hoe, grape mattock, or tiller to break up lumps. Add a 1-2” (2-5cm) layer of compost, rake it flat, and spread any organic soil amendments you’re using evenly over the surface. If you’re using composted manure, add a 1” (2.5cm) layer of cow or sheep manure, or a ½” (1cm) layer of poultry manure. Mix the soil amendments thoroughly into the soil. Planting tomato plants is really the only option in temperate zones in the northern and southern hemispheres. Growing tomatoes from seed outdoors is only possible in the warmest climates, with 4-5 months of hot summer weather and long sunny days. Local nurseries usually offer tomato varieties that work well in your area, but their selection may be limited to a few old stand-bys. For a wider range of choices, try starting tomatoes from seed. Seed catalogs offer a stunning array of heirloom and hybrid tomato seeds to choose from, and starting your own seeds is cheaper in the long run than buying seedlings from nurseries every year, especially if you have a big garden. 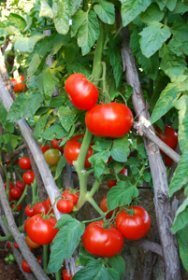 When growing tomatoes, plant spacing varies, depending on cultural technique, depth of soil preparation, and variety. 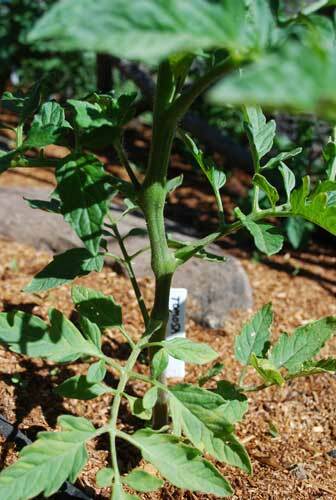 Plant Determinate (Bush) Tomatoes 14” (36cm) apart in rows 24-30” (60-75cm) apart. 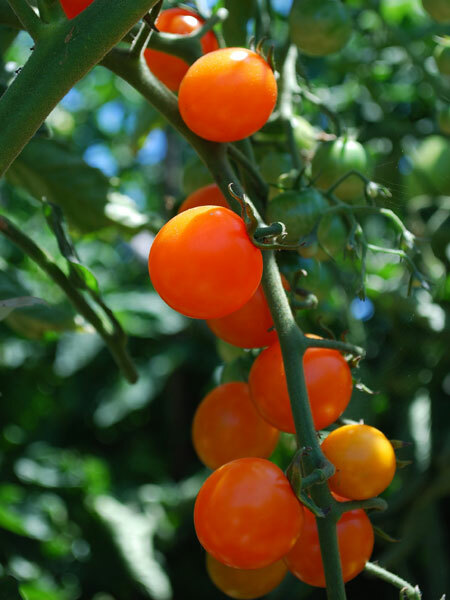 Plant Indeterminate Tomatoes 24-30” (60-75cm) apart in rows 32-36”–0.8m–apart. Plant Determinate (Bush) Tomatoes on 16” (40cm) hexagonal centers (seedlings 16” (40cm) apart in all directions within the bed). 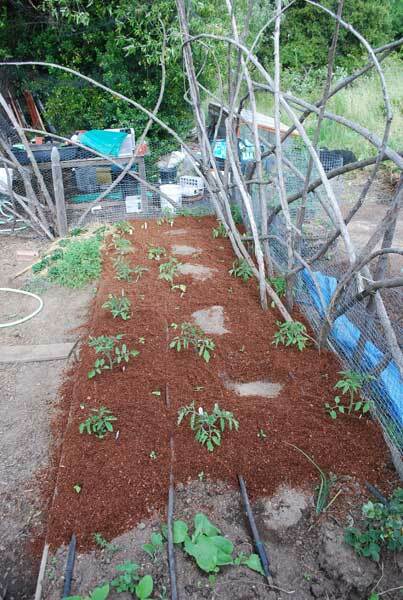 Plant Indeterminate Tomatoes on 24” (60cm) hexagonal centers (24”–60cm–apart in all directions within the bed). If you’re growing tomatoes vertically, Italian Grandfather-Style (training them to 1 or 2 main branches and pruning out the rest of the vegetative runners) you can tighten spacing to 18-20” (45-50cm) hexagonal centers in a deep-dug or raised garden bed. Don’t do this if you can’t keep up with the pruning and tying. This spacing is too tight for undisciplined plants, and crowded tomato plants are more susceptible to pests and diseases. Plant tomatoes after all danger of frost has passed, when the soil has warmed up into the 50’s (10+ C°). Invert the pot and carefully remove the plant. Loosen the root ball by squeezing gently and wiggling your fingertips along the bottom to loosen the roots. If you’re going to inoculate the plants with Endo-Myccorhizae , this is the time to do it. Tomatoes evolved with myccorhizae helping them assimilate nutrients—especially phosphorous—from the soil, and inoculating them can improve yields 10-20% over un-inoculated plants. A fine dusting over the moist roots is all that’s needed. When planting tomatoes, set the seedlings a couple inches deeper in the ground than the root crown. The soil line can be above the seed leaves (the first set of leaves on the stem). Most plants suffer when you do this, but tomatoes—especially leggy tomatoes with long, thin stems—perform better when planted deeper. Roots will form along the stem where it’s in contact with the soil, anchoring the plant more firmly in the soil. Stage 1 Watering: Get the plants established. For the first 2 weeks after planting, water a little bit every day or every other day if it doesn’t rain, to get the plants established. Overhead watering is best at this stage. Stage 2 Watering: Make them stretch their roots. After the tomatoes have been in the ground for 3 weeks, when the vines are thickening up and beginning to grow aggressively, back off on the watering. Let them dry out for a few days. 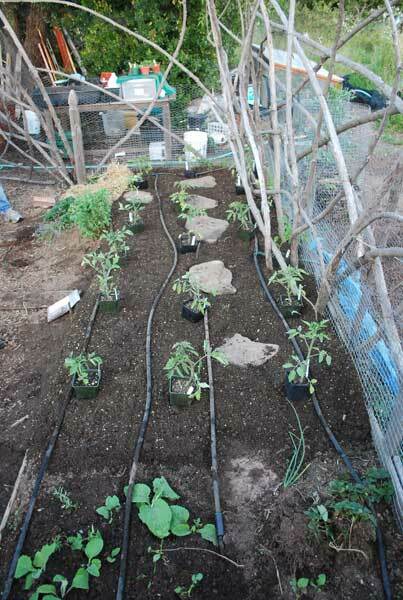 At this stage, you want to make your tomatoes work to sink their roots deeper to find water. If it’s really hot and they’re wilting, give them some water. The point is to make them stretch, not stress them excessively. After a few days, give them a good, deep soaking. Saturate the soil, then let it dry out again for a few days, to make your tomatoes stretch their roots even deeper into the soil. When you’re growing tomatoes, the deeper their root systems, the more nutrients they can pull from the soil. The more nutrients they can pull from the soil, the larger, more vigorous, and more resilient your tomato plants will be. Large, robust plants put off garden pests, resist diseases, and fruit more heavily. 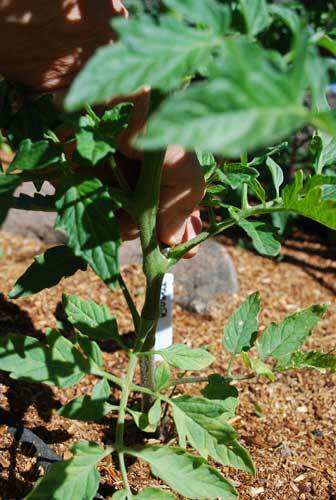 Stage 3 Watering: Once they’re fruiting, give your tomatoes steady, even watering till they’re done producing. Once your tomatoes start flowering and setting fruit, shift to regular watering, a little bit every day or every other day, for 1-1 ½” (2-4cm) of water per week. Once tomatoes are thickening on the vine, the root system is about as deep as it’s going to get, and uneven watering can produce split fruit, especially with cherry tomatoes. This is a good time to switch on the drip system, both to automate watering, and to keep water off the foliage. Defending leaves from pathogens becomes less of a priority once plants start flowering and setting fruit. Water on the foliage of mature summer vegetables is an invitation to bacterial and fungal leaf diseases. If you’re growing tomatoes organically and building organic fertilizers into the soil when you plant, supplemental fertilizing usually isn’t necessary. If you didn’t build organic fertilizer into the soil when you planted, you may need to sidedress your tomato plants at midseason. Pull back the mulch about a foot (30cm) out from the stems on each side of the plant and lay down a 1” (2.5cm) layer of garden compost or composted manure. You can mix in organic soil amendments if your plants need extra nitrogen or other minerals at this time. Lightly cultivate the soil amendments into the soil, push the mulch back over, and water thoroughly. Try not to cultivate too close to the plants, to avoid disturbing surface feeder roots. 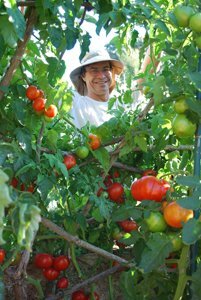 When growing tomatoes, providing support for the plants and dealing with pest or disease problems are the main plant care chores. 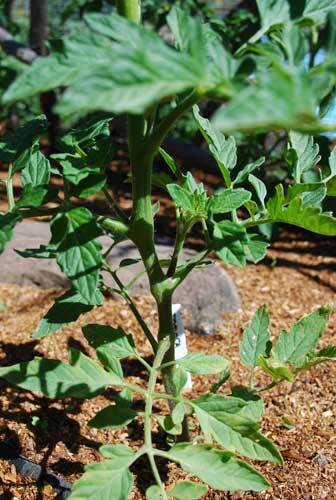 Determinate tomatoes grow on stout plants, but still need staking or caging when they’re heavy with fruit. Garden centers sell wire hoop cages that work well for this. Indeterminate tomatoes take more attention, but produce higher yields for a longer period of time. They need large cages—4-5 feet (1.5m) high—or tall stakes (8’–2.5m) to tie them to. 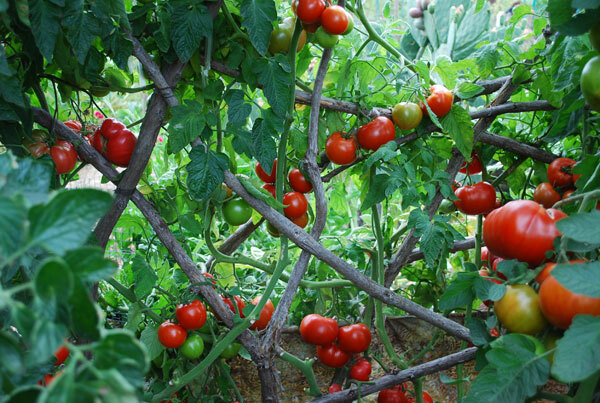 I like growing tomatoes through a trellis made of intertwined windfall redwood branches. You can use any branches you can find, and bend and wire them into different shapes. 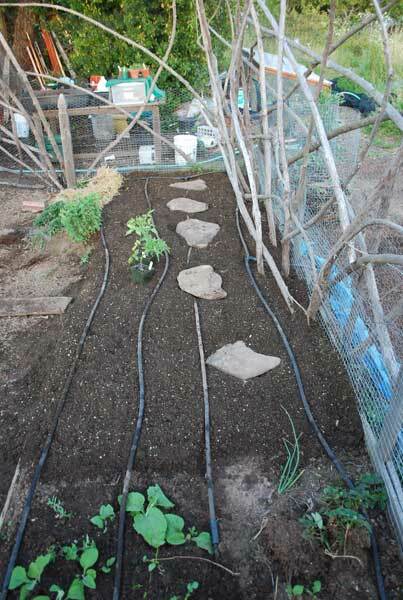 Just stick some vertical or curved sturdy uprights into the ground every foot or so. Zigzag them so one branch is in front, and the next branch down the line is 10-12” (25-30cm) back, staggering them along a row. Then weave arching horizontal branches between the uprights and wire them together with twists of 16-guage galvanized wire. Pound the twists down against the branches to avoid getting poked when you’re tending the vines. Run some horizontals on one side, and some on the other, so you end up with a trellis like the ribcage of a large animal. The tomatoes grow up through the “ribs”, and there’s a lot less tying. Sometimes you have to weave a leader through the trellis, but you can often just point it the way you want it to go, and it will grow that way. Whether you use cages or stakes, it’s best to stake or cage the plants a week or two after putting them in the ground, just as they’re starting to grow quickly. It’s almost impossible to cage a mature plant without knocking a lot of fruit off the vine. Tomato cages are easy, but I personally don’t like the look of them—too much hardware, like heavy braces and a retainer on a smile. If you can find green cages, they don’t stick out as much. 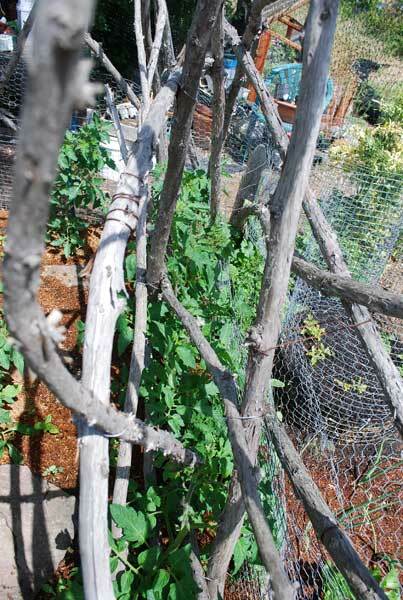 I prefer redwood branch trellises for growing tomatoes, or 8’ (2.5m) green-plastic-coated steel stakes instead. Pruning Indeterminate Tomatoes. To get the highest yields, pinch or prune out the vegetative runners that appear at the junction of leaves and stems. They look like little tomato plants jutting up at a 45° angle. Bend them back and forth until they snap off, or snip them off with garden sheers, and compost them. Make sure you know the difference between a vegetative shoot and a flowering shoot. 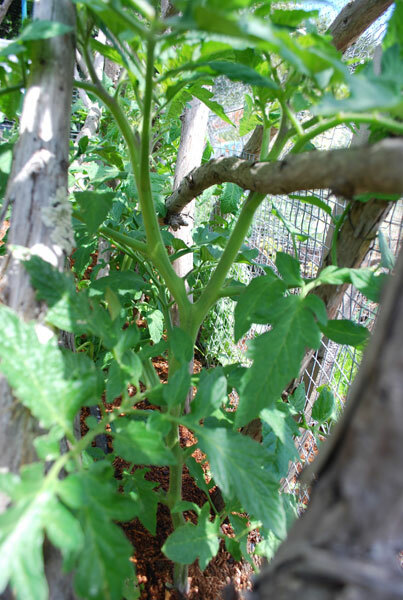 Vegetative shoots look like small tomato plants jutting out up from where a leaf meets the main stem. Flowering shoots emerge from the main stem itself, between leaf junctions. The idea is to train the vines to 1-2 leaders, and prune out side-shoots. That way, the plant concentrates more on fruit than foliage. Staking Tomatoes Most indeterminate tomatoes set flowers on the same side of the main stem. When staking tomatoes, wait for the first flowers to appear, then place the stake on the opposite side of the main stem. That way tomato clusters will form on the outside, instead of between the stake and the vine. Sink the stake 3-4” (7-10cm) out from the stem. Push it 10-12” (25-30cm) into the soil, so it’s solid. I like to use ½” (1cm) clear plastic tape for tying tomatoes, peppers, and other plants that need staking and tying. The tape is strong enough to hold the plant to the stake, but stretches as the vine grows, so it doesn’t constrict growth. You can tear it off at any length needed, and it’s unobtrusive, unlike the bright green tape that seems to jump out from the foliage. I tried figure-8 loops last summer, but used two rolls of tape instead of one. 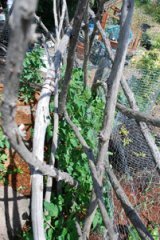 I also had more problems with vines slipping down the stake than I’ve had just spiraling them around the pole and tying them with a single loop and a square knot. Tie them every 6-8” (15-20cm).